Perched on a cliff overlooking Lake Erie, the stylish Pier W focuses on fish and seafood. 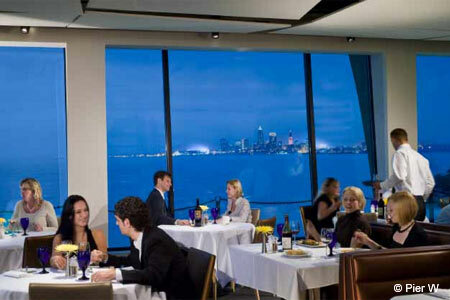 : With its up-close-and-personal views of Lake Erie and the Cleveland skyline, this landmark restaurant is a stunner. Décor is clean and modern, and the space is dimly lit so that the scenery itself becomes the star. Seared crab cakes are a favorite starter. Ditto for the citrus scallop ceviche, which is balanced and with just the right amount of acidity. Among entrées, we recommend the Great Lakes walleye tempura served with green beans and asparagus, and the gulf shrimp and scallop linguine. House-made bratwurst and shrimp sausage is both hyper local and worldly, owing to its pillowy spätzle dumplings and moustrada. For dessert, we suggest the cannoli cheesecake or the fudgy devil’s food cake. On Sunday, the brunch buffet is extensive and worth the splurge. Between its regular and reserve wine lists, Pier W's cellar stocks roughly 3,000 bottles.